He's been on the lam for three years. He's got his own Facebook page and his exploits made national news. And now, he's in custody. The "mystery monkey" was spotted earlier this afternoon near Lake Maggiore in St. Petersburg, shot by a tranquilizer dart and taken to Animal Hospital of Northwood. The rhesus macaque monkey is thought to have been cast out of a colony of monkeys in a more rural part of the Tampa Bay area. He then somehow made his way to very urban St. Petersburg. He was spotted numerous times and evaded several capture attempts, stealing the bananas from traps without setting them off. The monkeys are very social, so there was concern that the mystery monkey could be lonely. The last plan to trap him was using a live macaque as bait. The lighthearted story became more serious earlier this month, when the mystery monkey bit a woman in her backyard after jumping on her back. 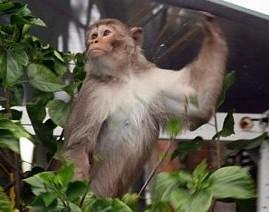 Some neighbors reportedly had been feeding the wild monkey.